Located in the heart of the city area, near to Arab Street, Haji Lane, Kampong Glam and Bugis area. 5-minute walk to Bugis MRT station, 5-minute walk to Bugis Junction and Bugis+ shopping malls, 10-minute drive to Orchard Road, 10-minute drive to Central Business District and Singapore International Convention and Exhibition Centre. 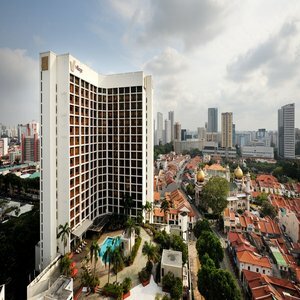 Located along Victoria Street, Village Hotel Bugis by Far East Hospitality is a 5-minute walk from Bugis MRT Station and a host of shopping options including Bugis Junction, Bugis+, Bugis Village and Sim Lim Square. For the culturally curious, the ethnic enclaves Kampong Glam, Arab Street and Haji lane are just minutes away on foot. The hotel features an outdoor pool, an alfresco terrace and a well-equipped gym. Free Wi-Fi is available in all guestrooms and throughout the hotel premises. Business centre services are available at the lobby. The 393 spacious rooms feature cable TV, tea/coffee facilities and bathtubs in the en suite bathrooms. Riverwalk Tandoor serves both Northern and Southern Indian delights, while the award-winning Mooi Chin Place offers Hainanese cuisine. The rooftop cafe Shades offers poolside dining.